Could the Giants, please...please, never wear those stupid red jerseys again. They look like they're gonna break out into the Monty Python "I'm a lumberjack and I'm OK" song. This Jimmie Johnson-Jeff Gordon NASCAR Cup points race sure is electrifying stuff, isn't it? The Man of the Week award has to go to Mark Brunell of the St. Louis Rams. With most of his offensive line in intensive care, he goes out against the resurgent Saints and throws 27 for 33 and 302 yards. Though he still got sacked 4 times, he didn't throw one interception. He threw, instead, three touchdown passes. Man. I wish McNabb would just keep his mouth closed. Just play football, dude. OK, here's the super-duper mega-early 2008 prediction. Toronto Blue Jays. They scare the AL all year and make the playoffs. Could the "Fantasy Football Guy" on ESPN be any more of a Pocket Protector dweeb? 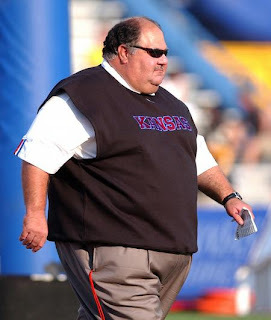 I can't name one team more fun to watch right now in college football than the Kansas Jayhawks and any coach more cool than their Mark Mangino. And Kudos to College Gameday for going to a Division III matchup, to cover student-athletes playing the game, not for a big contract, but because they love the game.